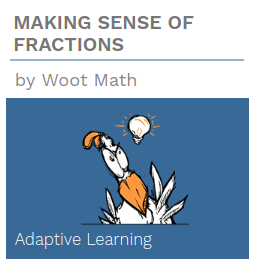 Woot Math’s Adaptive Learning enables students to master key foundational topics like fractions, decimals and ratios by building conceptual understanding. For grade 6, Woot Math is a grade level supplement for core fraction, decimal and ratio curriculum. For grades 6-8 (and above), Woot Math is also a supplement to ensure your students develop a strong foundation of fractions, decimals and ratios so they can be successful in all types of mathematics. Woot Math enables students to succeed by building conceptual understanding of key fraction, decimal and ratio topics. We recommend that you begin by assigning your students the book — Fraction Refresher III. We recommend that you begin by assigning your students the first book — Making Sense of Fractions. When students are struggling with operations of fractions, the issue is typically not with operations, but with fundamentally understanding fractions and fraction equivalence. The first 5 books of Woot Math are designed to provide them with this essential foundation, while engaging them and building their confidence. For more insight on how this can be a powerful tool for your middle schools students, read South Middle School’s case study of how 80% of Tier 2 and Tier 3 6th grade students gained at least 1 grade level using Woot Math 1-2 times per week for 8 weeks. 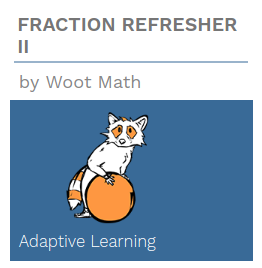 We recommend that you begin by assigning your students the book — Fraction Refresher II. This book covers key foundational material through equivalence. Are your students ready to move forward with operation of fractions, or do they need to start on one of the foundational topics – Making Sense of Fractions, Ordering Fractions, or Equivalent Fractions? After your students complete Fraction Refresher II, you will know what topics they have mastered, and what they are still struggling with. HOW DO I ASSIGN A SPECIFIC BOOK ON THE TEACHER DASHBOARD? The assignment will then be available in your students’ dashboard. To learn more about implementing Adaptive Learning in your classroom, read more here. WHAT IS A WOOT MATH SESSION? A session is a dedicated time that students can independently work on Woot Math. A session can happen during a math lesson or during individual study time. HOW DO I USE THE PROBLEM BANK? 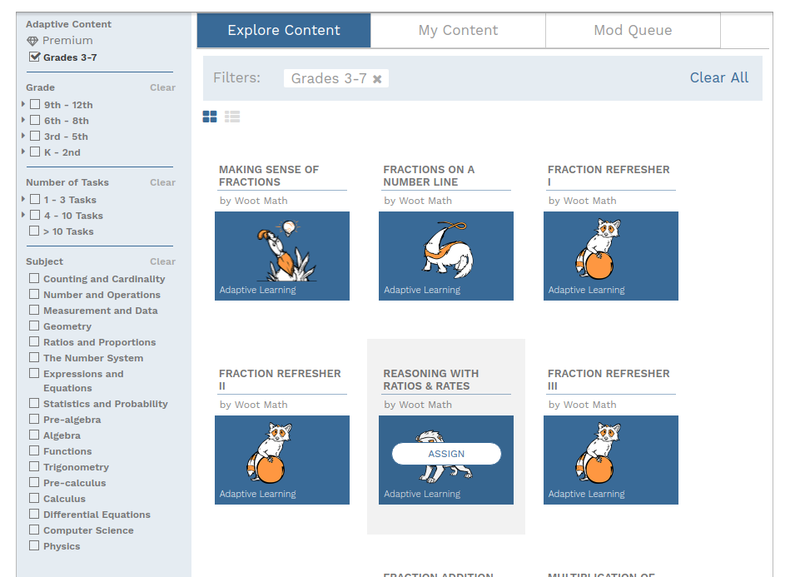 For in-class instruction, Woot Math provides teachers access to the thousands of interactive problems that students use in Adaptive Learning. These hands-on, digital manipulatives can easily be projected onto a whiteboard and really bring to life group-led instruction. This problem bank also provides you with visibility into the scope and sequence for each topic covered by Adaptive Learning. You can also review the scope and sequence here. You can get started today for free. Just follow these 4 easy steps. Have questions? Let us know. We are here to help.